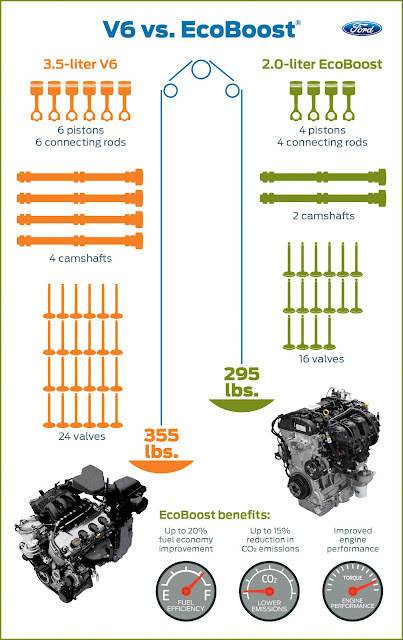 Brighton Ford : Ford's EcoBoost Takes Lead in Reducing Engine Size Without Giving Up Performance! Ford's EcoBoost Takes Lead in Reducing Engine Size Without Giving Up Performance! For as long as we can remember size has meant everything when it comes to the amount of power an engine can supply -- the bigger the better, right? Not so much anymore. Ford is changing the way we think about engine performance with their EcoBoost line -- smaller engines that run more efficiently without sacrificing the power we've grown accustomed to. Check out the recent Ford release below for details on all the benefits the new EcoBoost engines bring with them when they show up in the 2013 Ford Escape and 2013 Fusion. In addition to developing more horsepower per liter than the larger engines they are replacing, EcoBoost motors are helping Ford reduce vehicle weight, which improves handling and braking and helps increase fuel economy. The 2013 Escape and Fusion models provide a graphic example of why Ford’s new generation of smaller, lighter and more powerful engines are better. In the 2012 Escape and Fusion, the 3.0-liter V6 engine is rated at 240 horsepower and 223 lb.-ft. of torque. That engine weighs 340 pounds. The new 2.0-liter EcoBoost four-cylinder engine that is optional in the 2013 Escape and Fusion is rated at 240 horsepower and 270 lb.-ft. of torque and it weighs 295 pounds, 45 pounds less than the old 3.0-liter. The 1.6-liter EcoBoost engine available in both vehicles delivers 178 horsepower and 184 lb.-ft of torque and weighs just 223 pounds. Since launching EcoBoost in summer 2009, Ford has sold more than 180,000 EcoBoost-equipped vehicles in North America, making it the most rapidly adopted fuel-saving technology in recent automotive history. According to Ward’s sales data, it took Toyota 50 months, for example, to sell 100,000 gasoline-electric hybrids in North America. And Ford’s EcoBoost lineup outsells all competitors’ diesel, compressed natural gas and battery-electric cars combined. EcoBoost is a suite of technologies that combines turbocharging with direct injection, variable valve timing and precise engine controls to increase the power output and efficiency of the gasoline internal combustion engine. The increased power output enables Ford to replace a V8 engine with a V6, a V6 with a four-cylinder and a four-cylinder with a three-cylinder – with no loss of performance. If you have any questions about the New 2013 Ford Escape, or anything else please feel free to Contact Us. We would be happy to field any questions you may have!